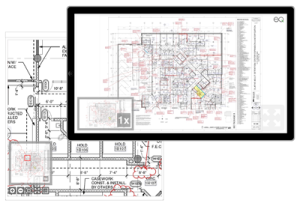 Perfect for any company doing Architecture, Mining, Exploration, Engineering, Manufacturing, or Construction of any kind, the new UniZoom AEC™ dynamically updates access to all your PDFs with relative linking: you never have to physically download large files to see what they contain.This powerful feature offers quick and painless viewing of your PDFs across multiple devices with “read-only” capability over as little as a 4G network. With this new feature, you have the ability to open 300+ MB PDFs that were not previously available to download or view. UniZoom AEC™ offers full page viewing from any screen with dynamically resized controls based on device or screen resolution. This securely enables access to workers in the field with BYOD. Links are extracted automatically from Adobe Acrobat or Bluebeam files and inconsistently linked files are corrected (links to external files referenced in the same directory for example). The files are dynamically normalized, creating a consistent reliable viewing experience that is always current without the need for special applications or readers. This means users always get the latest and greatest file while avoiding downloading gigabytes of potentially out of date drawings.